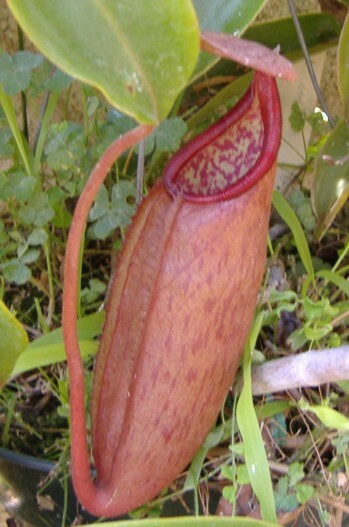 Nepenthes thorelii X densiflora is an Exotica Plants hybrid between a lowlander / intermediate and a highlander. This hybrid was given to me from a grower in a warm climate that said it was suffering and not doing well. So I took a few in and they've been doing quite well for me in my highland conditions outdoors. With N. thorelii being the female parent, a wide variety of conditions can be tolerated. I've had mixed success growing Exotica's N. thorelii outdoors for extended periods of time. However, when they have crossed them onto highlanders, I have pretty good success. Also, each seed grown plant is different. So a few of these might be more highland while other seed grown plants like lowland conditions. This hybrid has put out multiple growth shoots and is an easy grower.